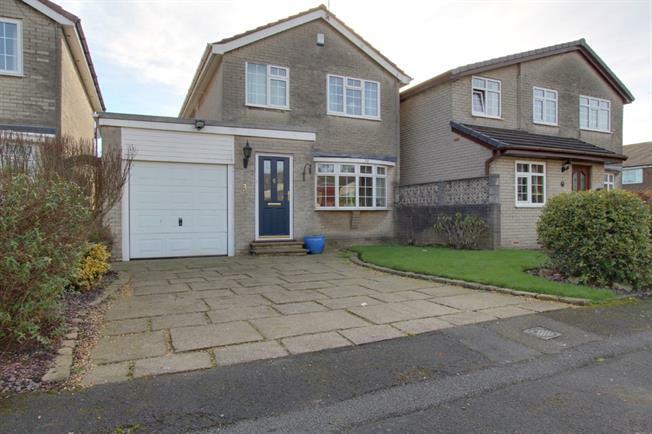 3 Bedroom Detached House For Sale in Hyde for Asking Price £200,000. This detached family home will be sure to attract early interest given its location within Mottram Village. Offering excellent scope to add your own stamp, this detached property comprises of an entrance hallway, living room, open plan dining room and kitchen with downstairs WC and integral garage to the ground floor. Upstairs there are three bedrooms and a family bathroom with further scope to extend over the garage to create a fourth bedrooms. Driveway parking to the front with gardens to the front and rear. Viewings by appointment only. Double glazed uPVC front door with a double glazed uPVC window with frosted glass. Radiator, electric wall mounted heater, carpeted flooring and ceiling light with stairs leading to the first floor. Double glazed uPVC bay window facing the front. Radiator, electric fire, laminate flooring and ceiling light. Double glazed uPVC window facing the rear. Electric wall mounted heater, carpeted flooring and ceiling light. Double glazed uPVC window facing the rear. Wooden flooring, built-in storage cupboard and ceiling light. Fitted wall and base units with complementary work surfaces, stainless steel sink and drainer, integrated Neff electric double oven, halogen hob and overhead extractor with space for a fridge/freezer. Double glazed uPVC window with frosted glass facing the rear. Heated towel rail, wooden flooring, part tiled walls and ceiling light. Low level WC and wash hand basin. Double glazed uPVC door opening onto the side with door opening into the rear of the garage. Electric up and over door, lighting and electric points. Double glazed uPVC window with frosted glass facing the side. Carpeted flooring, ceiling light and loft access. Double glazed uPVC window facing the rear. Electric wall mounted heater, carpeted flooring, fitted wardrobes and ceiling light. Double glazed uPVC window facing the front. Electric wall mounted heater, carpeted flooring, fitted wardrobes and ceiling light. Double glazed uPVC window facing the front. Electric wall mounted heater and ceiling light. Double glazed uPVC window with frosted glass facing the rear. Tiled flooring, tiled walls and spotlights. Low level WC, corner bath with an electric shower over and a pedestal sink. Driveway parking to the front with lawned garden, with planted borders and mature shrubbery. The rear garden has a paved patio area and large lawned garden enclosed with mature hedging, trees, shrubbery and fence panels.